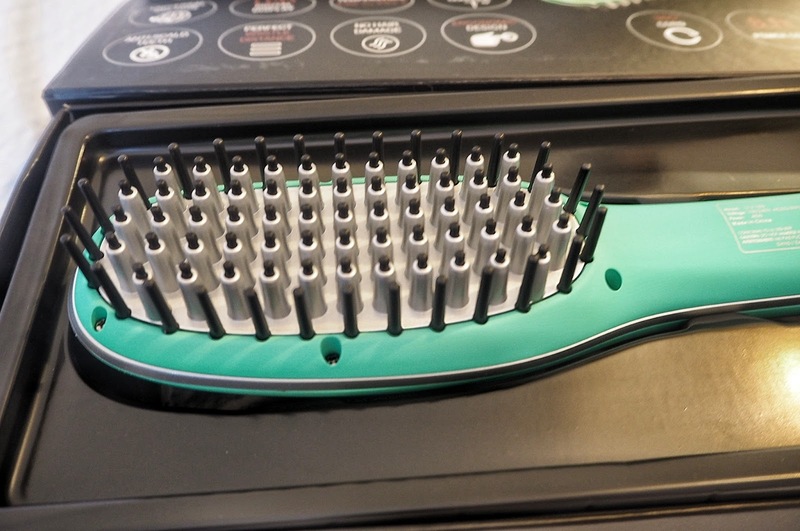 When New York based Irresistible Me contacted me about their range of hair extensions and products, I was instantly intrigued by their Jade straightening hair brush. So I waited in anticipation over the new year for my straightening brush to arrive from The States. 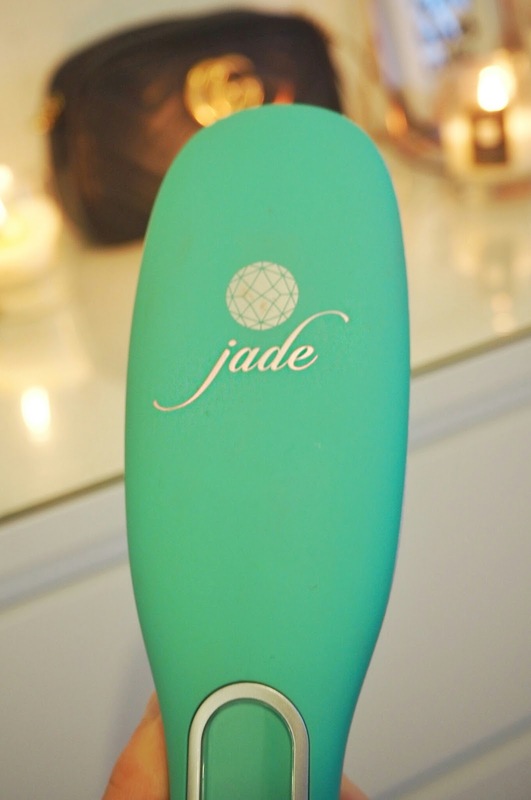 The jade colour of the brush really stood out against the understated packaging. If I was being picky, I would have preferred a brush in a rose gold or metallic colour, though it goes without saying I wasn’t going to misplace the brush among my hordes of clothes, which trust me is a good thing! One thing that worried me as I removed the straightening brush from the box was that it would be too bulky to hold to style my hair. Yes, not only am I not the best at mornings, incapable of styling my hair into any fashionable styles, but I also have the upper body strength of a kitten! I needn’t have worried as the brush wasn’t any heavier than my GHDs. 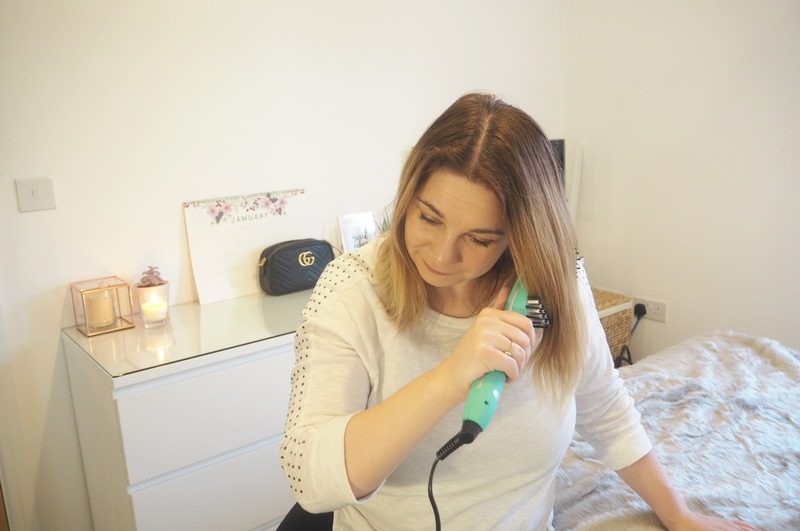 Armed with my new straightening brush and US to UK travel adapter I ordered from Amazon, I descended on my friend Nikki (one of my faithful hair stylists) and combined trying out my new gadget with seeing her new home. 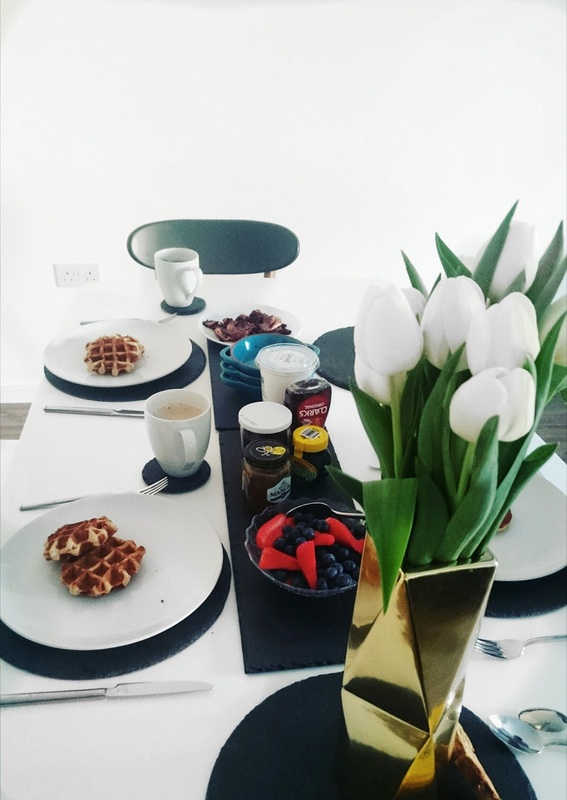 Before trying out the eagerly awaited straightening brush, we tucked into brunch cooked by Nikki’s housemate Aimee, which was incredible. 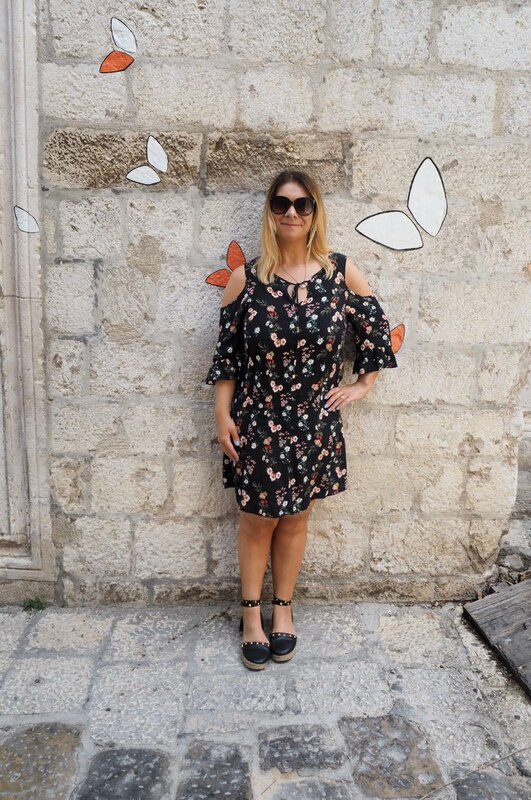 It turned out other than being great hosts (I’ve only been craving American breakfasts since I returned from San Francisco last June, worsened since my delectable trip to Dalloway Terrace), their home was the ideal instagrammable venue for my blog. Back to the task in-hand. We assembled my US to UK travel adapter, which cleverly could be transformed into a UK plug rather than a portable; meaning I could use my straightening brush on the go without worrying about forgetting my travel plug. – Link for travel adapter found here. The fact that the brush had auto safety features to shut the brush off if I accidentally left it on and would not scald or damage my hair were particularly appealing to me. My hair isn’t particularly wavy and I would say is of a medium thickness. I was hoping the brush would be able to take the kinks out of my hair from tying my hair up the night before. 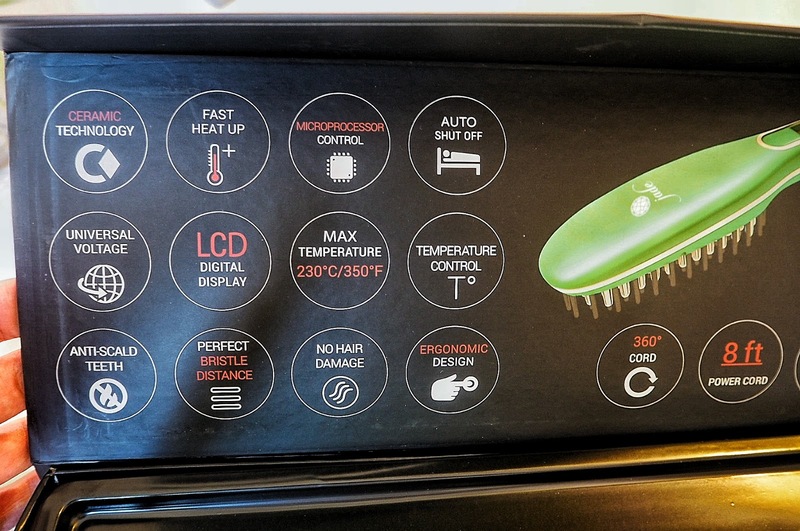 Before using, I read the instructions, which contained recommended heat settings depending on hair type and other useful information. 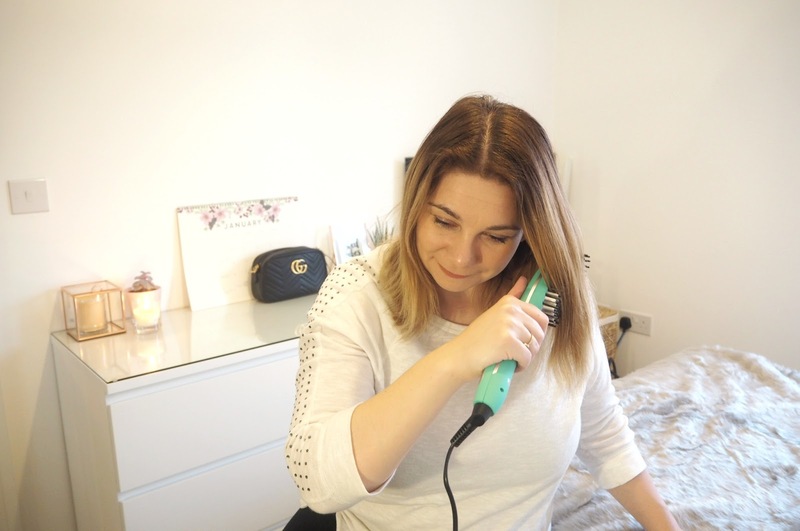 The special ceramic tourmaline heating brush gives you effortless straight hair without heat damage…The perfect bristles thickness and distance provide perfect contact between them and the hair, eliminating potential hair snags. 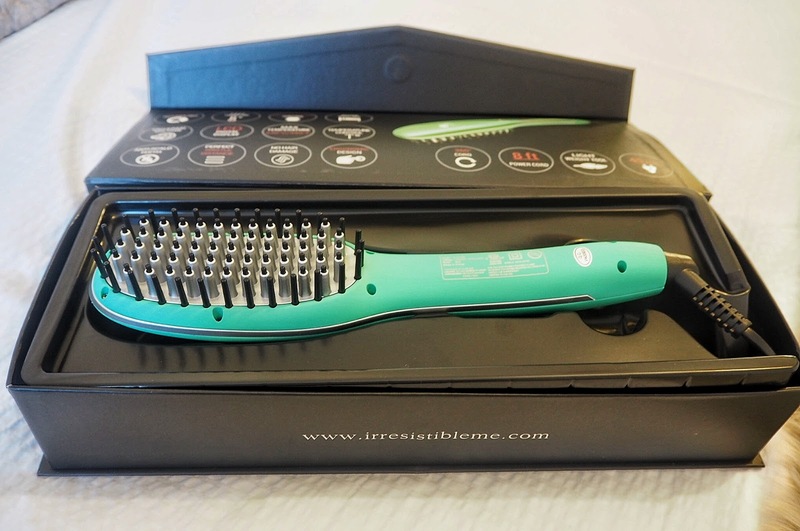 The ceramic tourmaline contact surface is also three times that of a normal flat iron, allowing you to quickly straighten larger sections of hair at a time…Brushing your hair and styling it at the same time makes this straightening brush fast, convenient and intuitive. The result is beautiful straight hair with a silky shine. 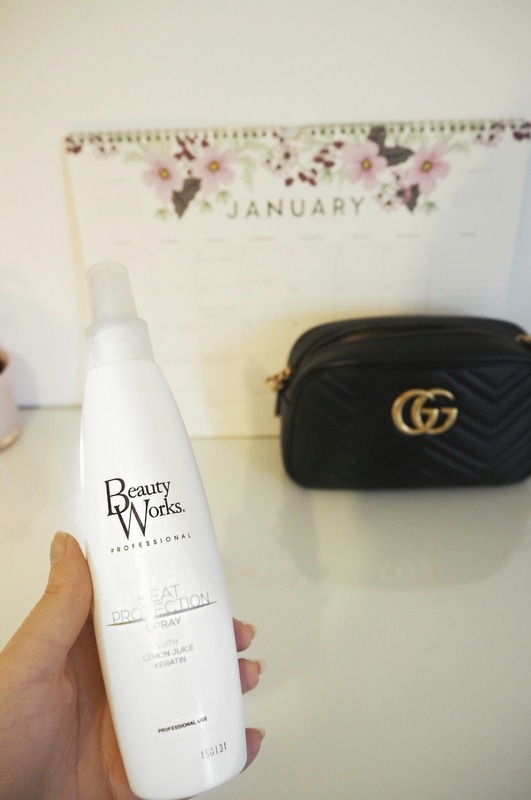 As with all hair appliances, I sprayed my hair with a heat protection spray and brushed through with a normal hair brush – I used this hair protectant from Beauty Works. 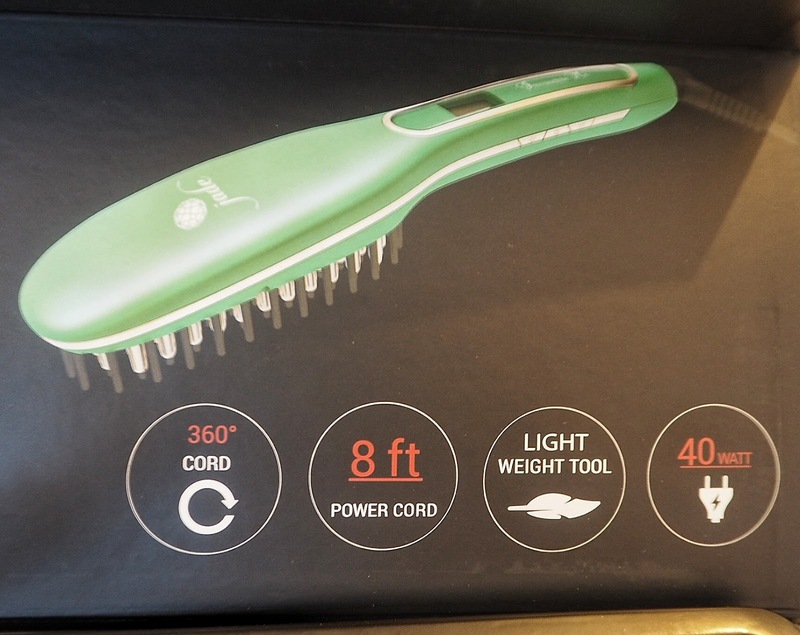 To turn on the straightening brush you hold down the power button for a couple of seconds before the temperature quickly increases; visible on the LCD digital display. Adjusting the temperature using the +/- buttons, I began gently gliding the brush through my hair, holding on to the end of each strand as I worked the brush through. 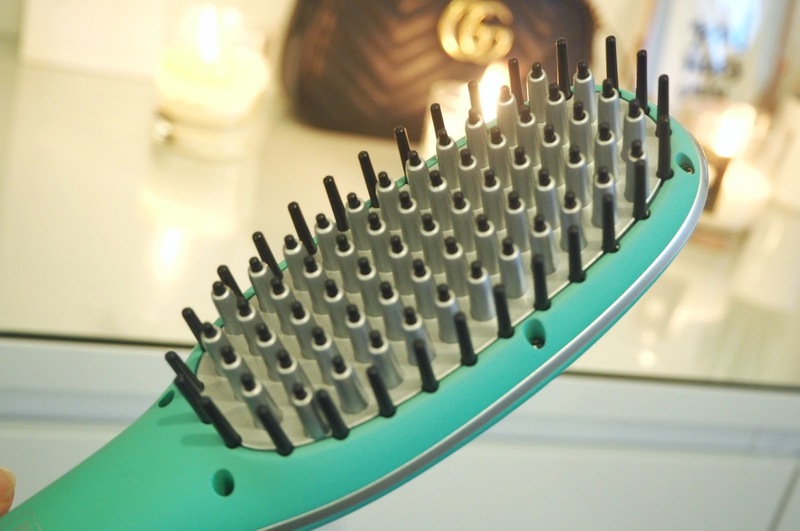 I quickly found that due to spaced out nature of the bristles and anti-scald teeth, I was able to use the brush with ease, without burning myself and found I could use it similarly to a normal hair brush. The 360c swivel cord and 8ft cable added to my ease and I was able to guide the brush easily through my hair. 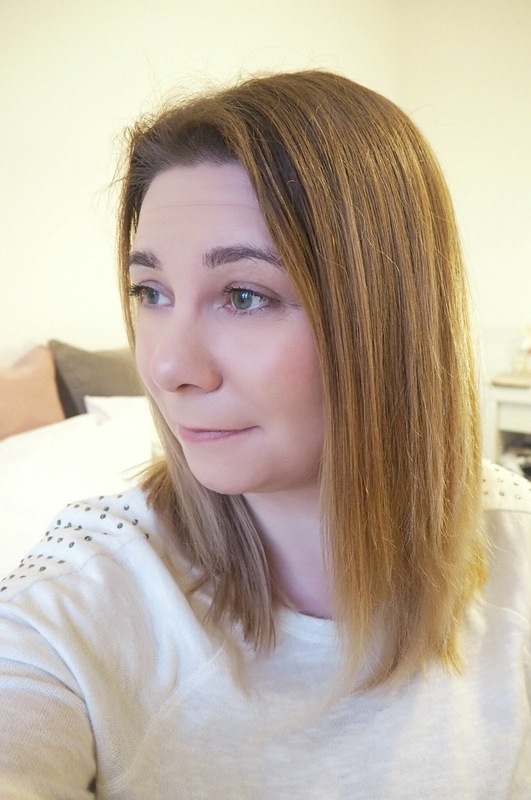 Whilst my hair wasn’t as poker straight as achieved with GHDs, I was pleased with the overall result as the brush had given me frizz-free straight hair minus the dreaded hair tie marks. 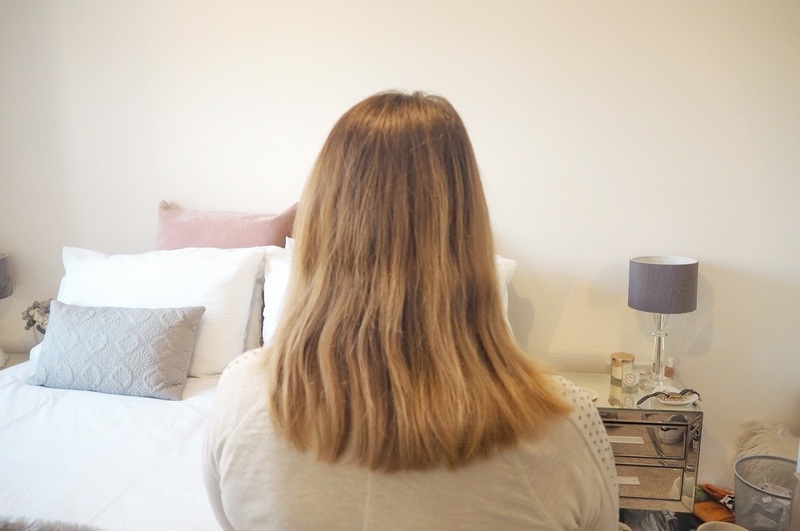 Not only that, I didn’t feel like the brush was doing nowhere near as much damage to my hair as straightening irons; which often leaves my hair feeling dry and damaged on the ends. Though, I did struggle to get the ends as straight, due to holding the strands when straightening the rest of my hair. 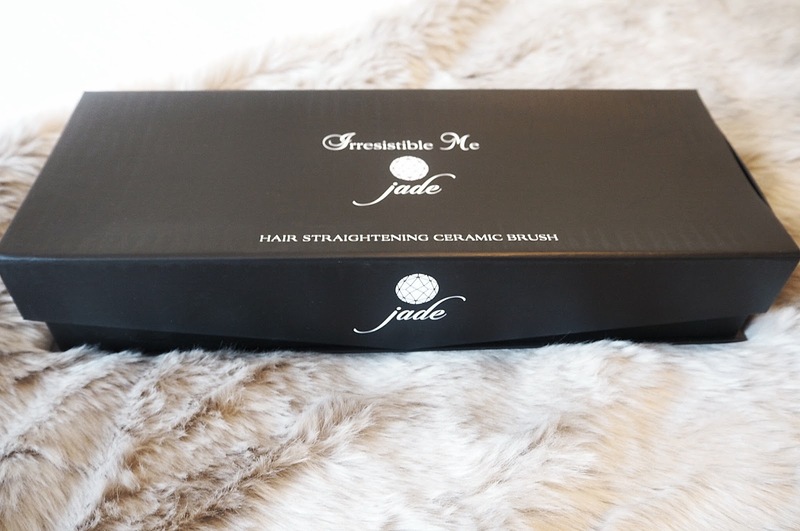 The Irresistible Me Jade Straightening Brush gave me effortless frizz-free straight hair and is ideal for everyday use. My hair felt smooth and looked shiny and straight. 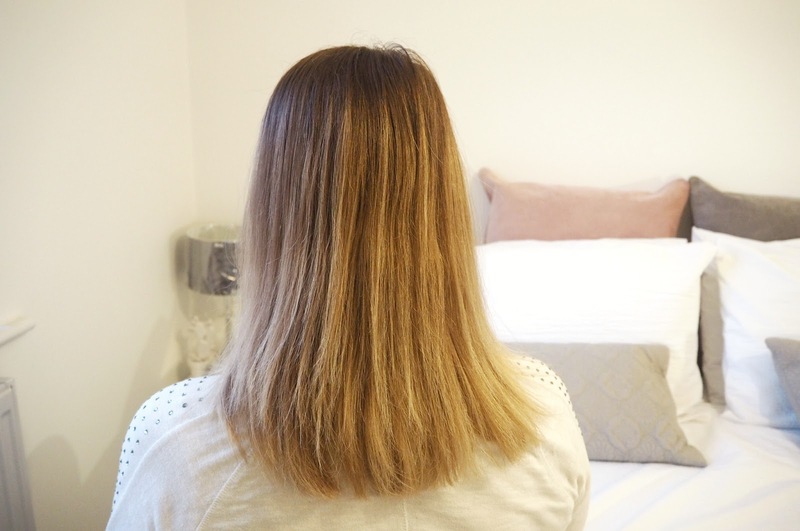 Whilst, I would still use my GHD straighteners for poker straight hair for a night out, the brush is ideal for me for the working week. The brush is priced at $45 (the equivalent of around £35) and can be purchased on the Irresistible Me website. Please note you will require a US to UK travel adapter, which can be purchased for a few pounds on Amazon.